Approx. 85 pages. Covers most general game parts used in Bally solid-state games from approx. 1977-1985 and many specific parts on Dolly Parton, Future Spa, Harlem Globetrotters, Nitro Ground Shaker, Rolling Stones, Silverball Mania, Space Invaders. 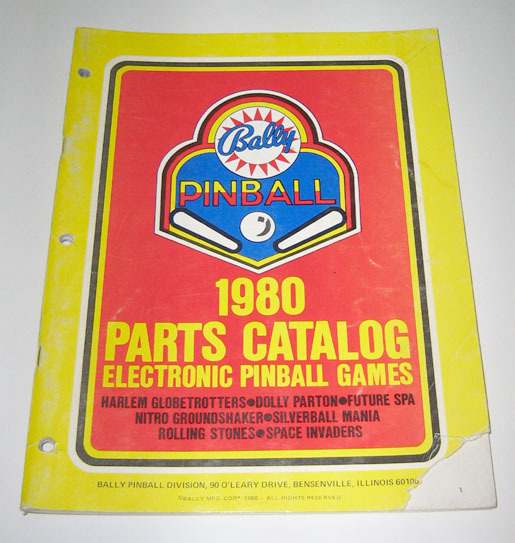 Includes full parts listings, part numbers, and part diagrams/illustrations of cabinet parts, playfield mechanical assemblies (flippers, bumpers, drop targets, etc. ), circuit boards, wiring harnesses, coin door, and accessory items. Used original catalog in excellent condition. Has one tear on lower right corner on front cover. No handwriting noticed on inside pages on quick flip-through.